A fun little place to share my art, photos, or whatever else fits my fancy. This weeks Simon Says Stamp Monday Challenge is Pets Corner. So I of course got excited at the prospect of the number of journal pages I could do, given the whole plethora of pets in my house. However when we got down to it I only had enough time to complete one. So this little guy is my wife's Chihuahua, Xander, he is about 10 weeks old in these pictures of him and weights roughly 1.5 pounds. He is now four years old and weights a whole total of 6 pounds, but he looks and acts just like he did back then. The background is archival reinkers mixed with rubbing alcohol in spray bottles, then I used ink through gear stenciles, and the light spots are where i used addition rubbing alcohol through the same stencils. The raised gears on the right side are made with fiber paste through a different gear stencil. I used water downed black paint to splatter on the background. I layered up the two pictures of Xander with matching textured cardstock. Added the paw print ribbons, stuck down the pictures. I stamped the sentiment and cut it out and added it over the top. Found some fun letters to put his name at the bottom which added the finishing touches. This is such an adorable page! I grew up in a pet-free home (except for a really angry parakeet we inherited from a school classroom), so I really enjoyed reading about your cuddly creatures! And what a totally lovable little guy Xander is! You've really done him justice with your page and I love both the photography and the design of this page. The letter tiles look fabulous and the background is perfect! This made me smile and wish I had a cute little dog myself! 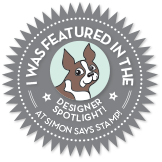 Thanks for sharing your talents with us for this week's Simon Says Stamp Monday Challenge! I am a 30 year old stay at home mom. My wife and I have two kids, and a plethera of pets, from dogs to reptiles to birds and rodents. I don't always get the time I would like to be creative, but when I have an idea I love to let it flow and see where it goes. I was featured for "Little Critters"